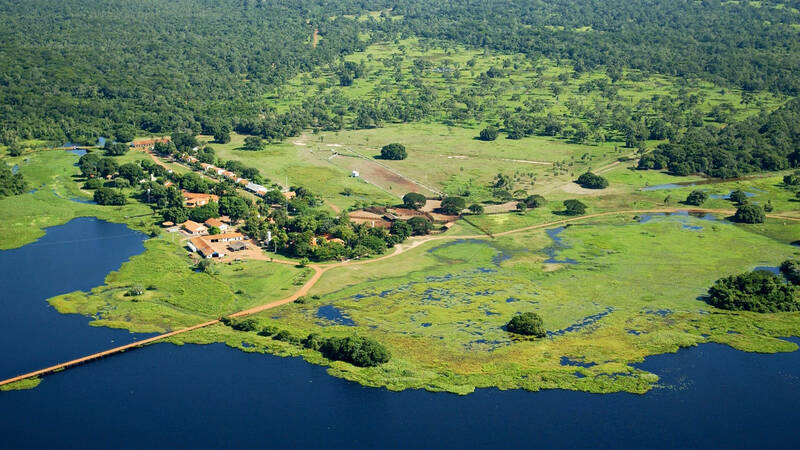 There are two ways to arrive at the Caiman Ecological Refuge: by car leaving from Campo Grande or by private plane. Follow the instructions below to arrive easily and to take full advantage of our amenities. Take Highway BR-262 out of Campo Grande towards Corumba. At the cloverleaf interchange in Miranda take a right, an asphalt road will take you to the city Agachi. There you will see signs indicating the way to the Caiman Ecological Refuge. Around 300 meters ahead take a left on a dirt road. Continue for 36 km and you will see the entrance to the Caiman Ranch on your right, where a guard will greet you and ask for ID. Once in Caiman, continue ahead and take a left at the first junction. You will pass over the “Ponte do Paizinho” and arrive at the Caiman Ecological Refuge’s reception. Caiman has a private grass landing strip 1400 meters long, well suited for smaller single and dual engine private planes. We do not offer taxi service. This should be arranged through a third party. 4. Distance and direction from the geometric center of city center: 31,0 Km – AZN030°, Mirandal. 5. Distance and direction from the closest aerodrome: 110Km – AZM 152°,Aeródromo Público de Aquidauana. 6. Distance and direction from the second closest aerodrome: 170 Km – AZM 301°, Aeródromo Público de Corumbá. 7. Altitude of the highest elevation of the runway: 110,13 metros. 8. Runway Dimensions: 1200m x 26m – gravel. 12. Runway construction and resistance: Gravel, 5.600 Kg./0,50 Mpa. 15. Daytime beaconing: in agreement with the the presented project. 16. Type of aerodrome: Privado Código “2”. Código SSEX Tipo de operação: VFR Diurna.